“The behaviour of the gold price is very suspicious in 50 per cent of the cases. This is not something you would expect to see if you take into account normal market factors,“ said Alberto Thomas, a partner at Fideres. Oddly enough this article from the Financial Times was removed from their website two days after publication. One of the most extensive researches that has been done on gold price manipulation is by Dimitri Speck in his book “The Gold Cartel”. 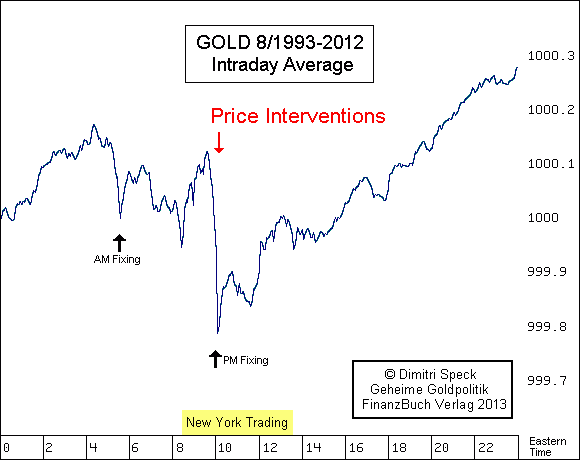 On his website there is a chart that illustrates what Fideres’ found about the London gold fix. Dimitri Speck was, amongst others, interviewed by 3sat for the documentary. I do not agree with everything that’s being said in the video, for example they state Chinese gold demand was 1066 tonnes in 2013, which is based upon numbers from the World Gold Council I happen to disagree with, or that it’s not necessary to invest in physical gold stored outside the banking system, though I thought it was worth sharing this clip with subtitles for the English speaking world. Germany is one of the few Western countries where there is a broad consensus about the importance of gold and sound money. Press the captions button and choose English. Translated by Behfar Bastani. Presenter: Good evening and welcome to the business magazine Makro. For many people, the purchase of gold represents a safe reserve for bad times. No wonder that, at the height of the financial crisis savers were queuing up at gold dealers. Throughout history, gold has served as a promise of reliability and stability. But today there are considerable doubts as to whether that promise remains valid, because an examination of gold prices reveals machinations fit for a financial thriller. Narrator: London, the most important gold market in the world. Whether the price of gold rises or falls is determined here. Twice a day, a handful of bankers confer on the phone to fix the daily price of the precious metal. Thus arises the most important reference value for physical gold, used by businesses ranging from jewellers to gold mines. There is no public oversight for the “Fixing”. Apparently, this lack of restraint has led to serious manipulations of the gold price, as pointed out by a current investigation which has detected strange price movements spanning a number of years. Rosa Abrantes-Metz: The setting of the gold fixing is, in my view, problematic. It opens the door for abuse and manipulation. There is absolutely no transparency in the arrangements made during the private phone conversations of this small group of participants as they decide what the price of gold should be. Narrator: Experts have long complained that this system is particularly susceptible to manipulation. Only five banks participate in the London gold fix, thus far including the Deutsche Bank. In the more extreme futures markets, where bets are made on gold price developments in future months, the quantities that exchange hands are of quite different magnitudes. Folker Hellmeyer: We have a situation where this market is dominated by three essential players, three banks, in the USA. These banks have a market share on the order of 80 percent. In other words, we are talking about an almost monopolistic structure which of course also provides the power to manipulate the market. Narrator: And which power is apparently being abundantly used. The futures market, intended to provide predictability and stability for future prices, is controlled by the following three banks: HSBC, Citibank, and JP Morgan. Their tool: paper gold securities. Narrator: The gold price has been attacked in this fashion time and again, often with massive price declines within a matter of a few minutes. Yet, there is quite a bit more to the story. Dimitri Speck: Gold is the opponent of debt based moneys, i.e. currencies, and in particular the US Dollar. Therefore, the US Federal Reserve has an interest in a weak gold price, and the US government protects the manipulation of the gold price by the private banks. Narrator: For years, the US Federal Reserve has served as the lender of last resort. Gold must be weak if a loss of confidence in the US Dollar is to be averted. It has been difficult to prove that this is a rigged game with a stacked deck, but if the gold market manipulations are indeed encouraged in addition to being condoned, that would explain why oversight bodies have thus far turned a blind eye to it, despite years of massive conspicuous activities in the futures markets, as with the gold fixing in London. in filling that spot. Too many banks are scared to damage their good reputation in London. Gold is a speculation commodity with a high symbolic power. Its price is therefore strongly influenced by many fears and hopes. Here are a few facts about that from our Makroskop. Narrator: 31.1 grams, the weight of one ounce of refined gold. The precious metal is regarded foremost as protection in times of crisis. Gold climbed rapidly during the financial and economic crisis. Currently gold trades for about USD $1300 per ounce. Yet the more hopes grow for an end to the international economic slowdown, the more the price of gold declines. The US government continues to hold the largest governmental gold reserves at 261.6 million ounces, over 8100 metric tonnes. The US is followed by Germany, Italy, France, and China. But the largest demand comes from the Middle Kingdom. From gold coins to gold bars, the Chinese are accumulating large quantities. In 2013 the Chinese acquired 1065.8 tonnes, moving for the first time ahead of the Indians who purchased 974.8 tonnes in 2013. Jewellery accounts for the highest portion of the demand. In China, jewellery sales have tripled since 2004. They represent about 30 percent of worldwide demand. About 400 tonnes was purchased by businesses. In particular, China’s electronic manufacturers need industrial gold for production. Meanwhile, in the mining sector, China has risen from being a small player to become the number one gold producing country. In the past tens years, Chinese gold production has more than doubled from 217 to 437 tonnes. Presenter: Today, the course of the gold market is being set by China. What are the worldwide consequences of this? Let’s talk about that with the chief editor of the Frankfurter Börsenbrief. Presenter: A very good evening to you, Mr. Bernhard Klinzing. These days the flow of gold seems to be from the west to the east, as we have just seen. There are considerably more buyers in Asia than in the developed western countries. What do you attribute this to? Klinzing: The reason is that India and China, which together make up half the gold market, do not have state provided elder care, which is valued differently there. Inflation fears are another factor. “The Chinese are the Germans of Asia”, it is said, and so they sit on gold. from the highest places. Do you believe that, or do you regard it as a conspiracy theory? Klinzing: I don’t believe that based on the Deutsche Bank and the London fix, but based on what we just saw from the Americans I absolutely do see that danger, because there is a quasi “Edward Snowden”. His name is Paul Roberts and he worked at the US treasury department and he has confirmed that the Fed, together with a number of banks, are preventing gold from rising above $1400 per ounce by continually providing gold bids which put downward pressure on the price. Presenter: Given the unsound loans that came to light in the Libor scandal or the forex markets, do you believe that this is only the tip of the iceberg in the gold trade? Klinzing: I would say that we are only seeing a snow ball from the iceberg while a lot more is hidden at the bottom. The banks earn a hefty sum whenever they fix the gold price by as little as 1/10th of a US Dollar upwards or downwards. You can see that with Goldman Sachs who published studies predicting gold’s decline to $950 per ounce while at the same time increasing their own gold positions by 20%. That does not match up. Presenter: What are some consequences for other market participants? You stated that the banks are lining their pockets, but what are some of the consequences? Klinzing: Yes, there is a hedge fund manager by the name of William Kaye who has said that the German gold is no longer stored in the vaults of the Fed in New York, but has already found its way to China because the Fed needed the gold in order to carry out its market manipulations. This is as yet only a suspicion, and it may even be a conspiracy theory, but the Germans were denied an opportunity to touch or take samples of their own gold in New York. Presenter: One could hardly think up a better plot for an economic thriller. I would like to talk about investors again. Is gold a good investment for the, let’s say, small investor? Klinzing: One should not construct a portfolio with only gold, that much should be clear. But of course gold is a very attractive portfolio addition, whereby investors can insure the value of their portfolio against currency risks. Because if the Euro rises, the value of gold falls, so you can participate only less than possible, therefore invest always in a currency protected fashion. Presenter: How can I do that as an investor? Klinzing: There are certificates for doing this, there is no need for an investor to store gold in their own vault or under their pillow. For that there are very good solutions on the financial markets. Presenter: Before we wrap up, what are your thoughts on how the gold price develops further from here? Klinzing: We can see that in China the standard of living is rising, the middle class will grow from 300 million people to 500 million by 2020, and urbanization is accelerating. This means that there will be much more demand for gold from China, as well as from India. I don’t believe that gold will break $1400 per ounce this year, but we will see a new gold rally in the next few years. Presenter: An overview of the gold price from Bernhard Klinzing of the Frankfurter Börsenbrief. Thank you for being on the show with us tonight. Dear viewers, if you have any questions for our studio guest, please visit the Makro blog where Mr. Klinzing will be available for a little while longer after the show. On our homepage you will also find additional background material on the topic of gold.